Need to decide between the LitterMaid and the ScoopFree? Here you will find the main differences not only in the design of both units, but also on the alternatives how to adapt these devices to fit your cat needs and your convenience as a cat owner. To make a good and equal comparison I chose the Littermaid Mega and the ScoopFree Ultra because they are both similar in features and the best version of each brand. Before any comparison, first let’s see briefly how they work. If you need more details about the mechanism of each brand, you can click on the full reviews. LITTERMAID 980: The LitterMaid features a rake that collects the litter clumps to deposit them into a plastic waste receptacle. You need to buy these receptacles as they are disposable (there is an alternative to this, more details on the LitterMaid full review). In the following video you can see that the LitterMaid 980 it’s bigger than the Classic Littermaid. (LitterMaid 980 is also called “Multicat” when the unit comes with more supplies, suitable for multi-cat use). 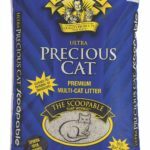 SCOOPFREE ULTRA: This automatic litter box features a rake and it uses blue crystals instead clumping litter. The bottom of the ScoopFree is a cardboard disposable tray filled with blue crystals that you need to dispose when it has reached its lifespan. You need to buy disposable trays with this system (there are some alternatives for this, check details on the ScoopFree Ultra review). Following you will find a comparison chart with the main features and also some issues of each unit. Also, a more in-depth analysis of the features and “Cons” of each model and how this affects their usage and operation. Resets for another 10 min if cat re-enters	 Resets for 5,10 or 20 minutes, depending on settings. Includes: Paw cleaning ramp, Scoop/Rake cleaner, 4 waste receptacles, 4 carbon filters. Includes: Paw cleaning ramp, Scoop/Rake cleaner, 4 waste receptacles, 4 carbon filters. With an in-depth analysis of how each design determines its usage and operation you can have an idea about what brand fits your needs the best. 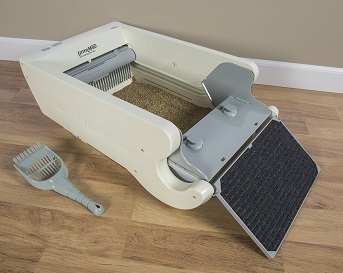 LitterMaid is longer and with higher walls than the ScoopFree, so it can be used for larger cats. The ScoopFree is more suitable for smaller cats. As mentioned, ScoopFree works with disposable cardboard trays filled with blue crystals. This tray gets attached to the main unit so it forms part of the unit’s bottom. Once the tray is full with urine and clumps (crystals absorb the urine, it doesn’t form clumps) it needs to be tossed and replaced with a new one. Instead, the LitterMaid uses clumping litter and the rake needs to rake and collect the clumps formed by urine and feces. 1. ScoopFree system is a little more expensive but easier to manage. LitterMaid as it uses clumping litter, the clumps will get stuck at the bottom because it’s hard for an automatic rake to collect clumps that get attached to sides or bottom of the box. With the ScoopFree you will need to do some scooping as well, but the system it’s more convenient in the long run. 2. The ScooFree manages the urine smell much better than LitterMaid. The silica containing in the crystals allow the ammonia to be absorbed and dried. 3. As the crystals don’t form clumps that could block the rake, the motor of the ScoopFree doesn’t produce too much noise when operating and in fact, it’s quiet. The LitterMaid, on the other hand, has a loud motor when the rake is raking. 4. The ScoopFree should be located in areas with good ventilation and free of moisture since this affects the absorption’s capacity of the crystals. The LitterMaid doesn’t have this problem because clumping clay litter works in dry or humid areas. 5. ScoopFree and LitterMaid need supplies for the system to work, but both brands have alternatives to avoid buying pre-filled trays or plastic waste compartments. 6. Both systems work better with cats that don’t excessively urinate or defecate. Especially the ScoopFree doesn’t work for cats that produce too much waste or urine. 7. Both units can be used for 2 cats, but in my opinion it’s better to use them with one cat. The ScoopFree’s rake has a much better design than LitterMaid’s. The rake is angled when moving forward to deposit the clumps, and it reverses the angle when moving backwards. Also the rake’s tines are larger and more efficient. The crystals don’t form urine clumps so no problem for the rake to spread out the crystals when it moves and it most likely won’t jam. Instead, the LitterMaid’s rake could get blocked if there is a litter pile or a big clump stuck at the bottom. Also, the rake doesn’t fully touch the bottom of the pan so it doesn’t completely rake the base. 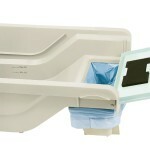 As we know, the ScoopFree uses a disposable tray that gets attached to the main body. This leaves a seam between the tray and the body that could be subject to leaks if you have a cat that sprays on walls. On the other hand, the Littermaid doesn’ have a seam in the middle so this wouldn’t happen, unless you have a high spraying cat in which case you need a different solution. The ScoopFree allows you to adjust the delay time in case you don’t want the clumps to be sitting on the crystals for too long or if on the contrary, you want to feces to sit longer and get dried before being picked by the rake. On the other hand, the Littermaid doesn’t offer flexibility and the wait time is 10-min by default. The LitterMaid features battery power backup so the unit will keep operating in case of power loss. ScoopFree works only with AC adapter. Although the LitterMaid features a power backup system, its reliability when operating without supervision is slightly lower than the ScoopFree. This is due to the possible blockage of the rake if litter piles or clumps accumulate. After analyzing both brands they have some similarities but mostly differences. 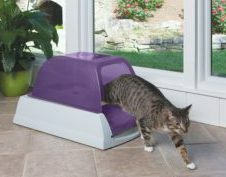 ScoopFree is a much better designed automatic litter box, with higher reliability regarding operation. The ScoopFree system although could be a little expensive, it’s cleaner and more convenient than the Littermaid. 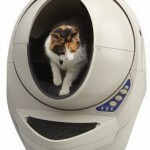 On the other hand, the Littermaid offers a better price and more room for the cat to do its business. 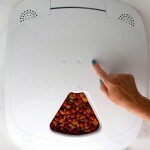 In conclusion, choose the ScoopFree if your cat doesn’t urinate too much and it’s on the small side. The supplies are a little expensive in the long run but you can work around this by getting permanent trays as detailed on the full review. Finally, with the ScoopFree a little scooping needs to be done, but not so much. If your cat is healthy and eats healthy, this is your best bet. If you don’t want to spend too much and your cat is on the larger side and you don’t mind to scoop here and there to avoid the rake encountering resistance for possible clumps, get the LitterMaid LM980. I love my ScoopFree litter box. I’ve had 2 of them in 11 years. The only issue that I have is that the rake is metal and deteriorates after a couple years and the litter doesn’t rake as level since the rake is very rough. The litter gets pulled back against the back of the box quite high. After a time the urine actually seeps out through the crystals over the edge of the disposable box and under the unit. I tape the sides and back up to prevent leakage. I have also contacted the company about getting replacement rakes but they do not offer them. I have to buy another unit again but I guess 1 every 6 years isn’t too bad. Thank you for your review. I will stick with the ScoopFree unit. You’re welcome Rosalie! I am happy your ScoopFree has worked great for your kitty.